DAY 2 MBFW. Still coming off my New York high - daydreaming about textures, colours, fit. These two handsome gents are my friends Rashad (@thestyleguyy) and Amechi (@bowtiemeach), stylist and tie-craftsman, respectively. Aren't they dapper in their fit-like-a-glove suits? We hung out together on our first experience inside NYFW, checking out shows that came our way, exploring the sponsor booths, and meeting fellow fashion influencers. Even a couple of weeks after, we're still keeping in touch and looking forward to bumping into each other at future events. It felt flattering and unreal to be snapped by streetstyle photographers and I tried chatting with each person afterwards to get a glimpse of his/her life story. For example, Pierre moved from France to NYC recently and used the festivities outside Lincoln Center as a springboard to launch his blog. you look AMAZING angie!! i <33 that skirt!! beautiful! That's so great, Angie, that you were able to experience your dream! So glad you had a wonderful and fulfilling time :) Hopefully, we can meet up next time you're in NY! 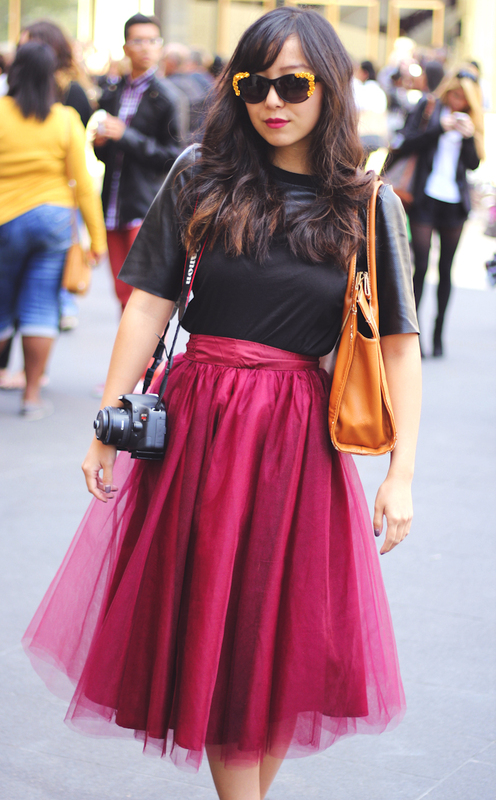 This skirt is absolutely stunning on you. I like her sunglasses and outfit.